A snake coils around a dainty wrist, a skull emerges from a murky depth, a doe-headed woman grips a knife. These are just some of the extraordinarily macabre details flourishing in Liza’s work. Composing finely detailed textures, drawing intricate swirling locks of hair and expertly shading facial features are skills she refined while studying illustration at Syracuse University as well as the Studio Arts Center International in Italy. The New York based artist uses a variety of tools including pen and ink, watercolor, gouache, acrylic and digital manipulation. Her work has the effect of capturing a moment within a vast fairy tale. Obscure animalistic elements and the powerful expressions of tragic characters compel viewers to conjure up their own fairy tales. In the following exclusive interview Liza reflects on story telling through the magic of art. Why is illustration your medium of choice for creative expression and when did you first discover you had a talent for it? Telling stories through pictures is the best way I can communicate my ideas. I studied illustration in school because it seemed the best way to combine my interest in fine art and my love of reading. But I’ve moved away from working as an illustrator in order to create my own personal works, where I can tell my own stories; I try to use elements from familiar stories and reshape them so that they take on a life of their own. . 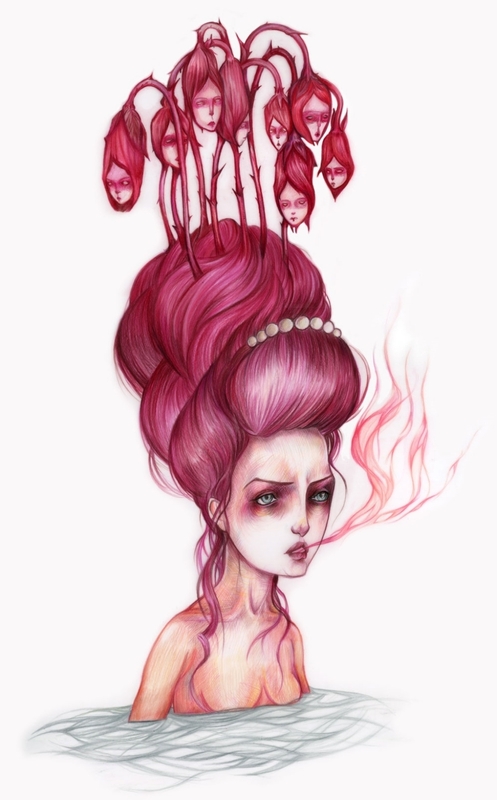 Your work reflects a morbid beauty in the macabre and melancholy. Where do you think your affinity for expressing the dark side of life comes from? I’ve always been drawn to a melancholy view of the world, from Gothic literature to early Tim Burton films. I was given a hardcover book of Grimm’s Fairy tales when I was a child. It had a purple cover, pages edged in gold and a satin yellow ribbon bookmark. It was such an elegant object, but the versions of the Grimm’s tales inside were so violent and ghastly! Reading those stories has had a deep influence on my creative process. Books of fairy tales and movies like Edward Scissorhands introduced me to a darker and stranger world that challenged my suburban upbringing. To be able to conjure finished pieces from loose sketches is a kind of magic that is always exciting. I’m so interested in how things change from the initial idea to the finished piece and to see what ideas blossom from the work I’ve created. And then to share my work and get feedback makes the whole process even better! It’s actually the reverse. When I find the time to immerse myself in a drawing or a painting, a deep sense of calm and peace supersedes my previous mood. It is an excellent kind of escapism for me. The woman in your drawings are very expressive and exude strength and distinct emotion. Where do you think your interest in expressing femininity and using female subjects comes from? Women are more fun! Their clothes, hair, physicality; their place in history, in myths and legends. I find it thrilling to create a world populated solely by women, and animals. There never seems to be enough time in the day to do all I want to do. I have so many ideas floating through my head and while I try to keep detailed notes for future pieces, it is sometimes hard to recapture the original spark. I have sketchbooks full of jottings and scribbles that often have become incomprehensible nonsense when I get a chance to revisit them.